I keep getting lucky on my pairings for Taste & Create. This time, Version 8.0, I was partnered with Jescel at Spice of Life, a delightful blog chock-full of yummy recipes. It didn’t take me long to settle on a recipe, however--I saw the words "carrot cake" and knew that’s what I had to make (and devour). Carrot cake is one of my favorite desserts, right up there with apple pie a la mode, strawberry shortcake, and anything combining mint and chocolate. I have at least 20 renditions of carrot cake in my abyss of saved recipes--I'm always on the hunt for the best recipe ever. Some have coconut, some have pineapple, some have cranberries, some have nuts. Most have cream cheese icing, which I’ve always considered a necessary component of the cake. In fact, it's probably the main reason I'm such a fan of carrot cake. Jescel’s recipe for Carrot Cake in a Cup was straightforward and looked like a winner. That being said, I made two major changes and a small tweak. (Is that allowed? I'm such a rebel.) One change reveals my sloth-like tendencies and the other reflects my aversion to messes. Change #1: Instead of grating carrots, I opted to use some carrot baby food. You tend to have a plethora of such things lying around when you work for a baby food company. That, coupled with the fact that I’m a lazy bum, was why I made this alteration. Small tweak: I was nut-less. There wasn't a walnut, pecan, cashew, or pistachio to be found in my apartment, so sadly, I was forced to leave them out. So much for a nice crunch. The plop of cream cheese on top was a stroke of genius, if I do say so myself. It’s a wonderful alternative to cream cheese icing (although clearly not as scrumptious--let's not kid ourselves here). Orange-bottom cupcakes, anyone? Thanks, Jescel, for feeding my need for carrot cake! Hee! Orange-Bottom Cupcakes! LOL! Love the idea of the cream cheese baked right on, it is genius and it saves time! They look delicious! I don't think I would have ever thought to use carrot baby food. But then again, I don't work for a baby food company!! They do sound great though - I'll never turn down carrot cake! Those look really good! I found you through Sarah at Homemade. Great blog! Oh what delicious carrot cupcakes! 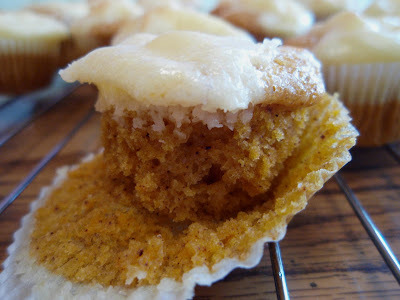 I'd have never thought of using carrot baby food in a cupcake what a great idea!! I know I'm not the only one who's said this... but I would have never, in a million years, thought of baby food. Even if I had a jar sitting right in front of me. I love it! 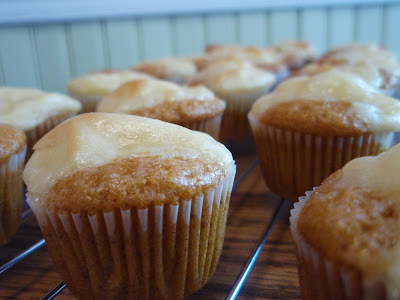 Baby food inspired orange bottom cupcakes! Clearly it's a carrot cake kind of week! What a good idea--using the carrot baby food. Let them peel, grate and process it for you! :-) Plus, it makes the time from start to in-your-belly quicker! The cupcakes look great. And they're way Cutie-Patootie! I used to watch Rosie O when I was in grade school, btw. Sorry they were a little sticky. That happens to a lot of my baked goods. I try to make everything as moist as possible. I love carrot cake! Cutie-patootie sounds rather funny!! Those cupcakes look yummy. Yum. What a great idea to bake the cream cheese in. I love carrot cake and that is such a great take. I bet my 9-month old wouldn't mind if I snagged a few of his baby food carrot jars and made these. Yum! Those look so good. Carrot cake is one of my favorite desserts as well. Using the carrot baby food sounds interesting. Another Tastespotting approved venture! These look soooo good I think some cupcakes are in my baking future. 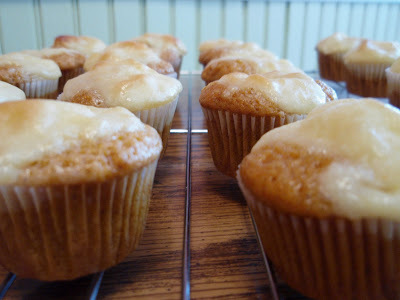 Love those - I can just taste the frosting, too! Thats a really great idea to use baby food! Carrot cake is my favorite too. I made a chocolate chip carrot cake last fall. yum. I'll be makin' these fo sho. YUM. Carrots were next in line for my muffin quest. Baby food definitely an interesting twist. Looks awesome!! These cupcakes look so delicious and tender! wow, Grace, you are a genious... baby food is a good idea.. might try it one of these day... i'm glad it turned out well.. now, I have to make time to do your recipe.. soon! 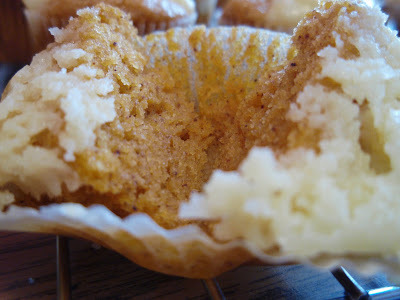 My most requested carrot cupcake recipe starts with 2 jars of carrot baby food, eheheh!! They sound and look wonderful! Like everyone else, baking with baby food is a new idea to me. I love it though! I'll have to try it some time. I was really intrigued by your phrase in the Taste & Create round up: "Ladies and gentlemen, we have a new contender in the hunt for the best carrot cake ever." I LOVE carrot cake! P.S. If I weren't such a cheapskate, I'd try the baby food method but bottled baby food is SO expensive!! today's all about you, eb!